The Aviation Historian, Issue 18 January 2017 . '... an excellent and well-rounded biography of one of Australia’s important early aviators'. RAAA News, Autumn 2016: '... author Kristen Alexander tells the airwoman's incredible story with warmth and understanding'. Aviation today doesn’t often make the headlines unless it’s bad news. Aircraft cross six of the seven continents hourly and usually do so to reach another continent on the other side of a vast ocean. Long distance flying is accepted if you want to see the world yet pilots of all ages still accept the challenge to tackle a route solo. Some do it in modern aircraft, some do it in vintage aircraft with or without a support crew. These flights remain remarkable achievements. If anything, today’s political and security landscape makes long-distance solo flights harder to plan let alone fly. This is especially so when trying to follow the flight path of a pioneer. Destinations have to be carefully picked and diversions assessed for their suitability and safety. Really, not a lot has changed since the early days of aviation. It is still an amazing effort to fly solo around Australia or fly to England in a Tiger Moth but, because of the airliners passing thousands of feet overhead, the mainstream don’t get it. It’s all been done before. That’s the key point. Being the first to do something can’t be taken away. With the birth of aviation, everything was a challenge. That said, it still took something incredible to be lauded as a pioneer. There are two types of pioneer aviator. Those in the first group remain household names to some extent: Amelia Earhart, Amy Johnson, Jean Batten, Charles Kingsford Smith, Bert Hinkler, Charles Lindbergh, Wiley Post, Alcock and Brown etc. They have been extensively memorialised, their aircraft, or replicas thereof, reside in museums or attend airshows, books are still written about them and their likeness appears on currency. Then there’s the second lot. The unknowns. Those who have achieved just as much, perhaps more, but have been almost lost to history. Were they the less attention seeking perhaps? They might be remembered on a plaque somewhere or have had a book published, or written about them, that remains long out of print. To me, someone who inhabits the world of historic aviation, but who regularly wears blinkers out of necessity, Lores Bonney is one of the forgotten. Well, with a bit of luck, and a good book, perhaps this will no longer be the case. One of Australia’s leading aviation biographers, Kristen Alexander, was asked by the National Library of Australia to write Bonney’s story using the library’s Lores Bonney Collection as the core. This collection, among various personal items, includes Bonney’s letters and diaries. Why is she significant? In a time when female pilots were regarded as somewhat of a novelty, Lores was determined to fly and, once she had achieved some semblance of proficiency, immediately started planning long distance flights. She first set a record for the longest one-day flight in Australia (more than 1,500 kilometres) and her second was a mere solo jaunt around the country. She was the first woman to achieve this. Mother England beckoned, as was its wont, so Lores set out to become the first aviatrix to fly there from Australia. Her trusty DH.60 Moth ‘My Little Ship’ was her companion on these first adventures and Lores, being the confident and driven type she was, trained as a mechanic and fitter so she was capable of maintaining the aircraft and effecting repairs. Husband Harry backed her flying financially but was always reluctant to let her go (although he did propose an idea that became her longest flight). While she is credited with that first flight to England, a prang while landing to avoid weather in Burma’s very southern regions, led to Lores disassembling the Moth on the beach and having it transported, by barge and ship, to Rangoon and Calcutta respectively. It was a journey of more than 1,800 kilometres. Her timetable flew out the window as did her ability to get through the rest of the flight ahead of the known worsening weather en route. In typical Lores fashion, however, despite moments of self-doubt and frustration, she battled through and made it. It was 1933 and something no other woman had done before. Lores followed the England flight up by becoming the first person to fly to South Africa, her country of birth, from Australia. This time she did it in a Klemm and the relative comfort of an enclosed cockpit. The destination was an inspired choice as, even by 1937, there were few aviation firsts to be conquered. The Klemm was falling apart and once again the weather played a big part in delays. Add in a little dysentery in India (and other health issues on the way) and bureaucratic bungling, and she didn’t arrive in the Union until mid-August, having left in April. What would be her final major achievement had been completed before her fortieth birthday. Her plans for further adventures were scotched by, first, the loss of the Klemm, now fully rebuilt, in a hangar fire and, second, the outbreak of the Second World War. She continued to fly, but eventually gave it up in her early fifties, and kept travelling overseas exploring the world before her death in 1994. To be honest, it is quite likely I would not have read this book if it were not for the author’s name on the front. It is outside what I like to think I specialise in (those blinkers again). That makes me a bit of an idiot as Lores Bonney was an unstoppable, albeit shy to a fault when out of the public eye, force of nature, her diminutive size belying an incredible fortitude that even managed to overcome her crises of confidence. With the resources available, I cannot think of a better author to tackle a new book (there is another, much older biography) on this pioneering aviatrix. The Alexander factor, as I like to call it, of teasing out personal minutiae, of tying together an inordinate number of threads, to sculpt an almost tangible image of a flyer long gone, is in full song here. Indeed, given it is a return to the individual biography for this author, after several years working on a collection of personalities, the Bonney work has captured a biographer at the top of her game. Having stepped away from wartime aviation and embracing the finicky, almost artisan, world of pre-war civil aviation, Kristen has got inside Lores’ persona and produced an insightful and revealing book. A large format softcover of more than 270 pages, the endpapers include a very useful map of Lores’ travels in the Moth and the Klemm. The photos, at least one per two page spread, are reproduced well with the left-hand page being dedicated to either a full page photo (usually of Lores) or a smaller image accompanied by a detailed caption. Many of the better photos of Lores are well-selected, and enlarged, and often speak volumes particularly those featuring the aviatrix elbow deep in an engine or at large in one of her many destinations. The narrative, therefore, is limited to the right-hand pages and effortlessly combines excerpts from letters and diaries with details of Lores’ preparations, innermost thoughts, flying, failures, successes and adventures. It is an incredibly easy read and those personal photos of Lores really make an impression. Kristen Alexander is building a solid reputation as an aviation biographer, and this one about aviatrix Lores Bonney adds to that. Born in South Africa, Lores came to Australia when she was five years old and considering her achievements, its surprising she's not as generally well-known as perhaps she should be. This book helos put things right. Those achievements are substantial: an Australian record for a one-day flight by a woman in 1931; the first woman to circumnavigate mainland Australia by air (1932) and fly from Australia to England (1933); and the first person to fly solo from Australia to Cape Town in 1937. Among the sources of information the author had access to were the detailed diaries Lores Bonney kept. The clever use of these makes the storytelling come alive, leaving the reader to feel he or she is in the cockpit sharing all the emotions, fears, highs and lows (of which there were many) that Lores did. The diaries also reveal personal struggles and the relationship with her husband, who bankrolled much of her early flying adventures. Published by the National Library of Australia in large format soft cover 'coffee table' form, the book is nicely produced and features a large number of illustrations including maps, newspaper clippings and diary extracts. And important and fitting tribute to Lores Bonney's 'extraordinary flying career'. Lores’ first flight was with Bert Hinkler in his Avro Avian, on 7 September 1928 from Eagle Farm, Brisbane. She learnt to fly under the tuition of Captain Charles Cuvet Matheson, the highly regarded owner of Matheson Flying School, in a Gypsy Moth (VH-ULJ). In December 1930, she was gifted a Gypsy Moth (VH-UPV) from her husband (which she affectionately called “My Little Ship”); obtained her private “A” Class licence on 19 August 1931; completed the then-longest flight for an Australian woman in December of that year; obtained her commercial “B” Class licence on 10 January 1932; and went on to become the first woman to fly around Australia later that year. Thus began Lores’ flying career. She went on to complete two further record-setting long distance flights from Australia – taking her Moth to London (1933) and her Klemm KL32x (VH-UVE), also known as “My Little Ship II” to Cape Town, South Africa (1937). Lores’ contribution to aviation occurred during a time when aeronautical developments were opening up the world (as we know it today), and the “explorers of the skies” were putting their life on the line, pushing machines and humanity equally to their limits. Lores was amidst it all. Through this book, we come to appreciate the high regard and genuine respect offered to her by the male dominated aviation industry, as evidenced by her involvement is numerous official celebrations for national and international aviation achievements. We also grow in understanding about Lores - the woman, who was keen to assist in searching for the lost Stinson, who grieved the untimely deaths of many aviation contemporaries, who held strong ambitions to achieve long-distance flying records, and who balanced this with a deep respect and gratitude for her Husband, whose support of her desires enabled her to pursue them. Taking Flight evokes the experiences of flying in the 1930’s. It awakens the senses to the realities of flight faced by the pilots of the era – open cockpits, constant vibration, exposure to extreme temperatures and weather conditions (wind, rain, monsoons, heat), the need for emotional and psychological resilience, self-denial of fluids prior to flights, etc. It also reminds us of the dangers that were frequently encountered – engine problems, machine damage, unplanned repairs, forced landings, navigational issues, inadequate maps, fuel supplies, and so on. This book provides open and honest insights as to how Lores responded to, and at times struggled with, exposure to these types of hazards. Taking Flight is a very informative and engaging read, incorporating many of Lores’ own words to describe how she persevered through the many challenges that came her way. It has been meticulously put together, using multiple primary sources, most notably Lores’ own notes recorded at the time. It is complimented by a large number of visual accompaniments including excellent photographs and highlighted extracts from Lores’ notebooks, to further illustrate her experiences. The 280 pages includes 20 pages of glossary, references, a bibliography, illustration credits and a comprehensive index. Taking Flight is a timely tribute to a little-known Australian pioneer aviatrix, who helped to lay the foundations and blaze the trail for future generations of women, encouraging them to take on various roles within a burgeoning aviation industry. Ultimately, it preserves the realities of Lores’ aviation achievements, and ensures they remain more than just a footnote to history. This book is highly recommended for all those interested in this pioneering era of aviation. Flightpath, Volume 27, Number 4, May-July 2016. Reviewer Andy Wright. From the cover's gold-embossed lettering to the beautifully clutter free map in the endpapers, this large format softcover demands to be savoured. Lores Bonney's extraordinary flying career is on a par with the great Australian, male, pioneers. The first woman to circumnavigate mainland Australia by air. That was 1932. A year later she became the first woman to fly from Australia to England. With flying in her blood, she beat everyone and was the first to fly solo from Australia to Cape Town. This was all achieved by the second half of 1937 before her fortieth birthday. It was a time of continual aviation achievement, and a very different period socially, and here was a shy (not he public persona) determined pilot flying a DH Moth, and later a Klemm KL 32, on epic solo flights. She was remarkable. Even a seasoned aviation reader develops a true feeling for the period through the incredible number of images that support the engaging narrative, The personal photos of Bonney, particularly during her travels and working on the aircraft, are astounding. There are no rose-coloured flasses here, and that is also reflected in the writing that is typical from this author. Access to the Bonney Collections held by the NLA and the Powerhouse Museum, and the author's famous eye for social detail, has resulted in a very personal, revealing and sumptous look at a person we should all know. Not until Bonney's manuscripts are publuished, if ever, will there be a greater insight into her life. A FIRST joy flight in an open plane when she was 30 was the start of a brilliant career for record-breaking Australian aviatrix Lores Bonney. Perhaps a little-known figure from Australian history today, Bonney was a celebrity in her heyday during an era when parts of the globe were still unsurveyed and even experienced solo pilots risked their lives in the air. Author Kristen Alexander examines the life of Bonney, born Maude Rose Rubens in 1897, in this account of the pilot who was the first woman to circumnavigate mainland Australia by air, the first woman to fly from Australia to England, and the first solo pilot to fly from Australia to South Africa. Taking Flight uses her diaries, newspaper reports, photographs and official documents to piece together a comprehensive history emphasising the great stamina, skill, fitness, diplomacy and courage needed to get her flights off the ground. Educated in Melbourne, Bonney settled in Brisbane when she married businessman Harry Bonney who largely financed her life in aviation. Alexander explains how Bonney’s 1931 circumnavigation of Australia was the equivalent in distance of flying from Darwin to England. She also details how Bonney lived through the death of famous Australian solo pilot Bert Hinkler — the man who took her on that first joy ride in outback Australia — when he crashed and died during a flight. The book also offers a fascinating array of anecdotes such as newspapers reporting a possible fatal accident when Bonney’s plane dropped off the radar during her solo attempt to reach England in 1933, and the time she masterfully handled a plane weighed down with so many treasures from a trip that it took five attempts to get it in the air at take off. Taking Flight is a lively, fascinating account of a gutsy woman with a grand passion for flight and of a long-gone world before budget journeys on Tiger Air or luxurious travel with Emirates business class. Maude Rose Rubens, who became Lores Bonney, was born in Pretoria and came, with her parents, to Australia in January 1903. Lores’ first flight was with Bert Hinkler, who was related to her by marriage. Marrying into money, Lores found herself supporting her husband in his endeavours, both business and sporting, while she secretly yearned to learn to fly. Finally persuading her husband, she joined the Matheson School of Flying at Eagle Farm, Brisbane. Charles Matheson had been a pilot with 3Sqn AFC and had continued to fly as a career after the War. Lores displayed aptitude, with Matheson having the confidence to reinstate the student’s control stick of his DH60 Gipsy Moth. Within months of her first solo flight Lores acquired, through her husband’s largesse, her own Gipsy Moth which she name My Little Ship. From this point on she knew that long-distance flying was her passion. Lores Bonney’s successes spanned an intensive six years through the 1930s. Acknowledged as the first solo woman to do so, she circumnavigated Australia, flew from Australia to Britain and flew from Australia to South Africa. Kristen Alexander has had unprecedented access to Bonney’s material, much of which is kept in the National Library of Australia and the book quotes liberally from her diaries, which in detail describe her triumphs and tribulations as she encounters appalling weather conditions, mechanical failures and the interaction of those involved in the early days of pioneering aviation. Kristen manages to engage the reader in these heady times and, as with all her works, she skilfully weaves a tale that is engaging and educational. Lores Bonney is one of aviation’s lesser-known identities and she deserves far more recognition for her accomplishments. She rubbed shoulders with all the big names of these early years – Amy Johnson, Nancy Bird Walton, Hinkler and Ulm. Taking Flight is a worthy addition to anyone’s bookshelf, whether you are an aviation aficionado or simply interested in the achievements of pioneers. 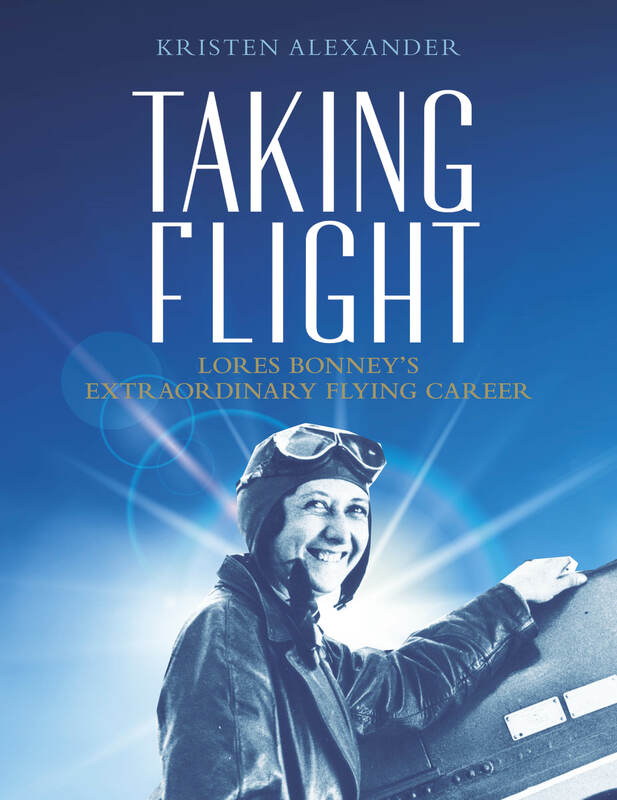 Taking Flight: Lores Bonney's Extraordinary Flying Career enhances understanding of Australia's era of pioneer aviation, and reinforces Lores Bonney's reputation as a significant Australian airwoman. ... This book will ignite the passion for flying in some and be a welcome addition to the library of all those who are enamoured of all aviation history or anyone who once flew or flies still. A wonderful and a great book about an Australian lady written by an Australian lady - perfect for all as a celebration of women for women and men everywhere. 20 February 2016. Aircrew Book Review, Facebook post. Driving home down the Hume today, tuned to 774 ABC, and I happened to stumble upon the first episode of CanvasWings I've had a chance to listen to. I swear I was thinking of catching up on Kristen Alexander's two ABC interviews only ten minutes before! Anyway, what followed was a good 25 minutes of listening to a friend's voice that I have not heard for some time (the perils of being in regular contact via email and Facebook). 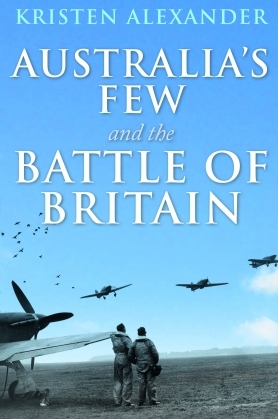 I said, in my review, that Kristen's coming of age as an aviation author was her sublime 'Australia's Few and the Battle of Britain', and it is, but 'Taking Flight' truly cements her as an aviation biographer of note (yes, I can remain objective in this case). While she admits to being handed the national Bonney collection on a platter, there is no denying the amount of work, thread pulling and thread weaving that went into this book. Andy Wright. 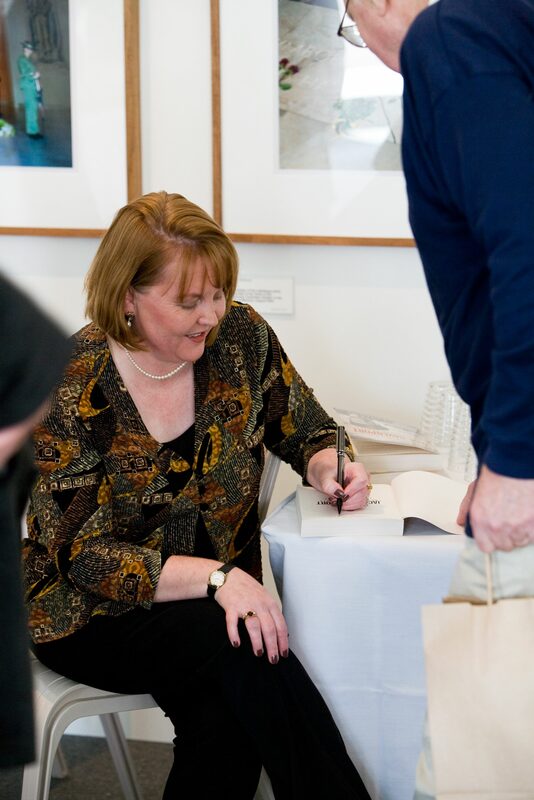 Canberra based author, Kristen Alexander recently dropped by to show us her new book which has taken a lot of research and one that she has been trying to finish around the release of other work for the last couple of years. I really enjoyed this book and learnt a lot about this Australian Aviatrix, her life and her record breaking flights. I very much enjoyed how this book was set out and found it an easy read which made sense chronologically so you follow her journey, if you like, into the world of aviation and her later years when she stopped flying. We tend to think of Amelia Earhart or Amy Johnson in regard to pioneering women flyers - not so often the Australian Lores Bonney. This very readable study of her flying career, which among other things, draws on Bonney's diaries 1933 [&] 1937, puts her achievements well and truly on the record. Born in South Africa in 1897, she and her family moved to Melbourne (the parents separated after her mother shot her father), she married and eventually settled in Brisbane. Childless, she started flying, in part, to do something. And she did. Bonney was the first woman to circumnavigate [mainland] Australia in 1932. A year later she flew to England, a fraught journey of monsoonal weather, a crash landing, and deserts, arriving at Croydon to a minimal reception. In 1937, she made the first solo flight to Cape Town. Well written, excellent illustrated production. A lovely surprise in my recent post was a special preview copy of her new book on the aviatrix Lores Bonney. … Kristen's done a terrific job telling Lores’ story, and I think the book’s turned out magnificently. It’s a great production, well footnoted and presented, and the hard graft of the writing and research has been made to look easy. … Lores Bonney's story is well worth a read, and well told here. From Andy Wright, Aircrew Book Review. After a missed delivery and then much gnashing of teeth over where it was in the system, the myriad shades of blue that is Kristen Alexander's latest book, Taking Flight, arrived late yesterday afternoon. The tale of Australia's globe-trotting Lores Bonney is in good company at ABR Central (my desk in the corner of the dining room). It is a big bit of gear - almost A4 dimensions and more than 270 pages - and is copiously illustrated by photos, artwork and some sublime maps. I wish every historic aviator would receive this treatment. From Tammy Augostin, National President, WAI Australian Chapter. What a lovely surprise to receive this wonderful book detailing Lores Bonneys’ life and her epic adventures. I have always referred to Lores as a true trail blazer of her time, pathing the way for female aviators in a man’s world. She certainly accomplished a great deal in her lifetime and set records along the way. An amazing lady and still an inspiration to many women today. The book is well written, factual and contains some wonderful pictures. Thank you for sending us a copy. From John Ulm's foreword to Taking Flight. Kristen Alexander's Taking Flight has it all. The sheer lyricism of flight - the curves and swoops, your own dimension. The lady of the sky has grace of line - with a mind of steel. If you ever get into collecting sooner or later you’ll end up with favourite works or examples of a genre. My book collection, while not layered with rare first editions, extends beyond aviation. Naturally I have my favourite fiction authors and avidly await their next instalments. Looking over my shelves as I type this I can see numerous books by Clive Cussler, Tom Clancy, Jack Du Brul, Alexander Fullerton, Patrick O’Brian, Douglas Reeman, Patrick Robinson etc etc. My wife, a much faster reader than me, is building her numbers of Kathy Reichs, Di Morrissey and Jodi Picoult, among others. The same applies to our non-fiction titles, namely the aviation ones. Over the years, I’ve developed small piles of Brian Cull, Steve Darlow, Lex McAulay and Mark Lax to name a few and am always excited to hear of new titles being published. To this list of favourite authors I can now add Kristen Alexander. 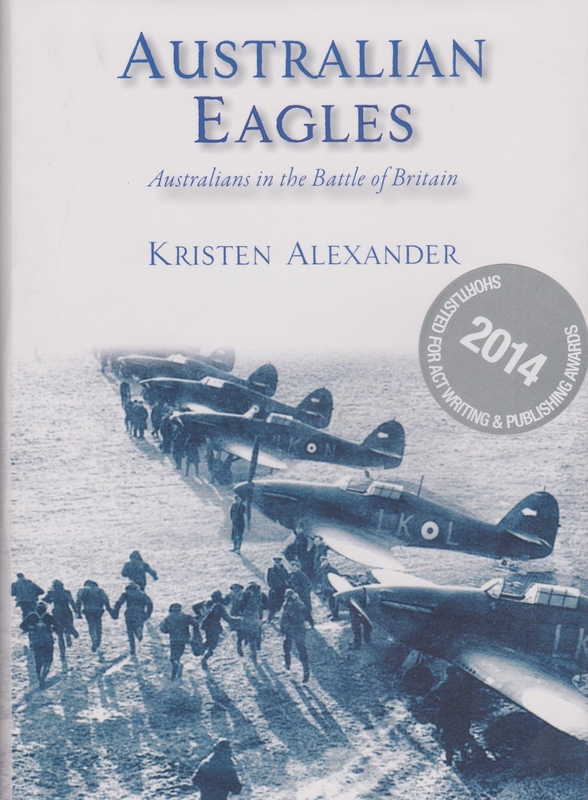 With the release of her second book, Jack Davenport, Beaufighter Leader, Kristen has firmly established herself as a quality writer shedding new light on the exploits of Australian wartime airmen. Jack Davenport had a childhood in country and metropolitan New South Wales that is largely familiar to the men who fought in the Second World War. Living through the Depression, the Davenport family was perhaps more unfortunate financially than the norm with bailiffs making their entrance on more than one occasion and numerous changes of address before things began to settle down in the second half of the 1930s. A natural athlete and a good student through sheer determination, Jack’s leadership ability begins to appear when he is made class prefect. His ambition and application sees steady progress within the ranks of the Commonwealth Bank and he readily accepts additional responsibility while in the militia. Joining the RAAF, he is initially mustered as an observer but is told if he does well he will be reassigned for pilot training. The Davenport determination steps in once again and Jack graduates first in his course … and then goes flying. Now, you’d assume any young bloke learning to fly would want to progress to fighters right? Perhaps, but not Jack. Modestly claiming he ‘scraped’ through Tiger Moths with a first-in-class pass of 88 per cent, Jack is chasing a challenge and succeeds in being assigned to multi-engined training. Being responsible for other people beyond himself appeals to Jack and this theme, which first appeared at school, continues throughout the book. There is a reason why ‘Leader’ is mentioned in the title! Anyway, training on Ansons in Canada follows where Jack is again recognised for his leadership abilities and also begins his passion for helping the community. Arriving in England and making the most of the requisite stay in Bournemouth, Jack is posted to 14 OTU for conversion to Hampdens. A woefully inadequate aircraft for bombing mainland Europe, the Hampden was filling the gaps in Bomber Command while the squadrons waited for large numbers of the new heavies – Stirlings, Halifaxes and Lancasters. Inadequate as she may have been, there wasn’t time to wait for something better. Besides, Jack was one of many fine men who flew her and was able to get the best out of the Hampden. With less than 19 hours on type – and an almost fatal spin in which Jack ordered the crew to bale out but stayed with the aircraft when he realised his navigator had not heard the message – Jack and his crew are assigned to 455 Squadron RAAF. Jack’s beginnings with Bomber Command are not the greatest but the ‘sprog’ pilot with the ‘sprog’ crew soon gains in confidence and experience and his skill as a pilot is evident. After several ‘shaky dos’ they are perhaps lucky when 455 Squadron is transferred to Coastal Command – lucky in terms of the enforced rest and removal from the Ruhr’s defences as opposed to a lucky transfer. What lies ahead for Jack and his colleagues is torpedo training and the risky operations any torpedo crew will of course face. 455 doesn’t have long to perfect its new-found abilities before it, in conjunction with 144 Squadron RAF, is ordered to Russia to help defend the Arctic convoys. Now a senior pilot with the squadron, Jack’s experiences traveling to, and serving in, Russia are eye-opening and a very valuable record. While not much was achieved militarily, these flights to Russia will forever be remembered. Returning from Russia in January 1943, Jack meets his future wife which adds another ‘angle’ to the unfolding story. Flying continues with Jack leading detachments and commanding the squadron as needed (getting a taste for command while the current CO is hospitalised). In a very short time, he had come a long way. With the loss of close friends and because of his senior position, Jack struggles to write letters to the next-of-kin. He feels the loss of his friends and colleagues keenly and, through happy (for want of a better word) circumstance, is able to commemorate those lost with a moving ceremony at the Dundee War Memorial – a ceremony that is still fondly remembered. This is a most moving part of the book and the culmination of a chapter that analyses Jack’s growth as a leader. Tour-expired, Jack instructs at 1 Torpedo Training Unit where he has an instrumental effect on lowering the accident rate – another example of him taking an innate interest in the men under his command. Now Acting Squadron Leader Jack Davenport DFC, and with more time on his hands, his romantic life comes to the fore and his relationship with one Sheila McDavid grows ever stronger. A proposal is accepted and arrangements made. A posting to command 455 Squadron arrives and the Beaufighter makes its entrance en force. You get the feeling Jack’s first tour is almost ‘marking time’. It is the foundation for which everything is built on and pales in comparison to what is accomplished during Jack’s second tour – even with the trip to Russia. Rated as exceptional by 1TTU and at just 23 taking command of 455, Jack, like his beloved squadron, comes of age. Re-equipping with Beaufighters, the squadron is a mix of experienced anti-shipping types (particularly the two excellent flight commanders Lloyd Wiggins and Colin Milson) and new boys but Jack and his flight commanders work hard to instill discipline and professionalism into the crews and, in the end, this pays off with the Leuchars Strike Wing (455 with 489 Sqn RNZAF) earning an enviable reputation among the labyrinthine Norwegian fjords. Never one to rest on his laurels, Jack, while bedding in the ‘new’ 455, marries Sheila. This is where the author’s writing shines. She gives the wedding ceremony and anecdotes from the honeymoon (low-flying mice on nuisance raids) as much importance as Jack’s military achievements. This firmly rounds out the understanding of the man, his life and character. With 455 operational again, the Beaufighter crews waste no time getting among the enemy shipping. The attacks are well documented and largely successful although not without some controversy which is well-handled by the author (friendly fire). Importantly, Jack’s role in the development of rocket attack tactics against surface vessels is well-documented. Really, a better pilot could not have been chosen – the consummate professional always keen to improve his already considerable abilities. As always during this frenetic time (before and after the invasion of Europe), Jack is close to his crews and well respected in return. The inevitable losses are moving and Jack’s efforts to rescue a colleague and subsequently earn the George Medal are told with typical detail and just a hint of modesty – a reflection of the man himself. The ace ship-buster’s success and influence on anti-shipping tactics led to a role as operations planner for the Group, a role he took on with typical dedication and care for those he was sending into the cauldron. War’s end sees his eventual return to Australia where the now young family settled and Jack began his work in industry. Applying the same drive and ability as he had shown in the service, Jack became one of Australia’s most respected business leaders – his achievements in industry perhaps only equaled by his commitment to his family and the greater community. His passing left a void that could never really be filled. He was mourned by several generations of Australians many of whom had the privilege of knowing a truly great man. 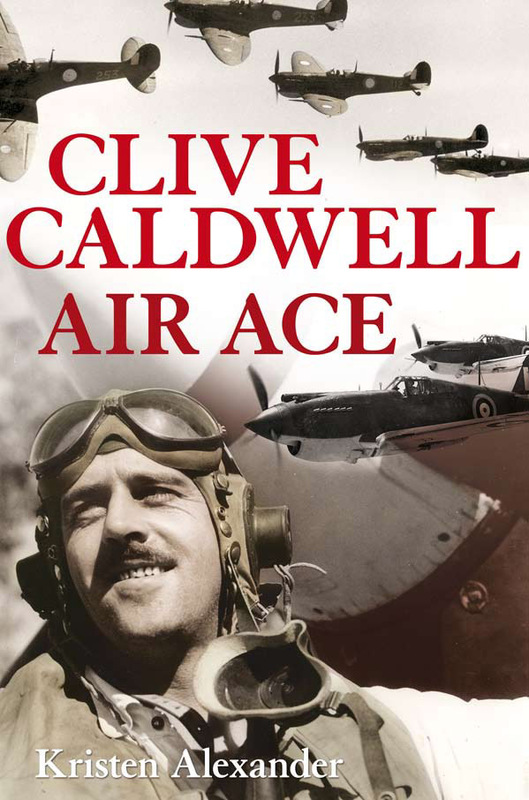 I mentioned in the review for Kristen’s first book, Clive Caldwell, Air Ace, that the author had developed a style capable of providing immense detail in a very readable way. I also commented how well I thought this style could be applied to a lesser-known personality. Happily, my guess was correct. This book is so easy to read - devour - and yet, as you can see from the ‘summary’ above, there is so much going on and so much to get across that it could easily have come off the rails. That it didn’t is testament to Kristen’s ability to keep a tight rein on everything – operations, Jack’s character, romance, the context of the conflict. Despite one technical detail hiccup, the writing is precise and Kristen has certainly found a style that not only conveys her research (again, great endnotes and variety of sources) but also makes it easy for a wider audience to be drawn into the world of Jack Davenport. 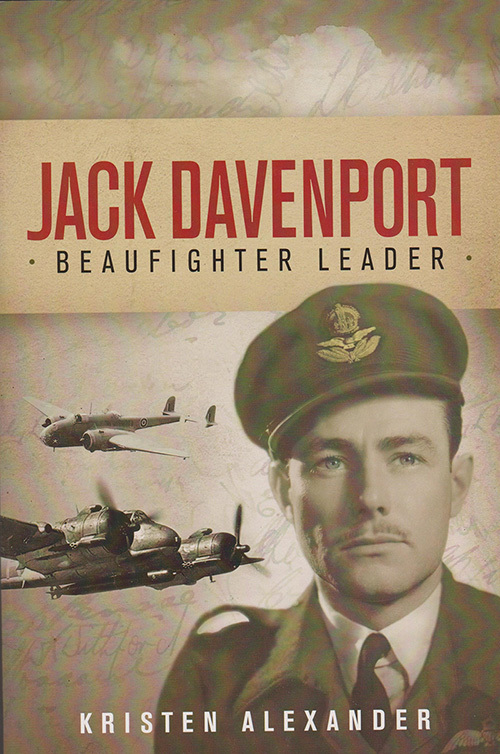 This book will appeal to aviation historians and enthusiasts keen to learn about 455 Squadron, its members and the Davenport family (Jack had two brothers who also flew … there’s a story in itself) as much as it will attract a more general audience of readers looking for a bit of realistic adventure. With an excellent cover typical of A&U (how often do you see a Hampden on the cover?) and three sections of brilliant photos this is a well-presented book and the perfect way to honour one of our great leaders...Do yourself a favour and invest in a copy. You will not be disappointed.